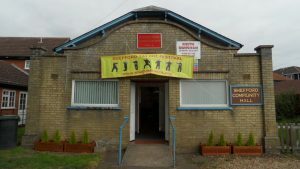 Share the post "Shefford Tai Chi Festival 2019"
2018 Shefford Tai Chi Festival review – World Health Organisation World Tai Chi and Chi Kung Day. We had a brilliant day again this year – despite the weather many more people came than last year and lots stayed for the whole day – we were delighted to see everybody. 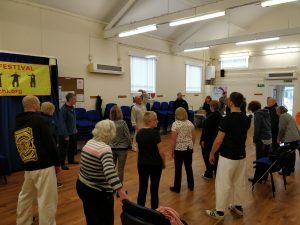 There was a lot of interest in all the classes starting with Tai Chi exercises to loosen up the body and a seated Zen meditation session to calm and connect both mind and body. The first guest presentation was from the ENSO Jujitsu group based in Clifton and headed by Lee Alexander, who showed us a variety of exercises and self-defence techniques with flowing movement and exciting throws including a female student taking on a series of attacks from the rest of the class. Visitors were encouraged to join in some partner work and experience the effectiveness of Jujitsu for themselves. There was a lot of enthusiasm and some laughter as everybody worked together co-operatively to learn these techniques. Ian Deavin then took a beginners Tai Chi class incorporating standing exercises and slow walking – the sort of activities that the Monday afternoon and Sunday evening classes regularly use to develop relaxation, balance and mobility and which are excellent for falls prevention in people over 50. By this point in the day the hall was quite full with many people sitting or standing with tea and cake while they appreciated the activities in the display area. Visitors were also able to visit the presentation booths for Massage/Aromatherapy with Tom Rigby who was giving free tasters all day and to discuss reading matter with Joy Lakin from Shefford Library, who presented a selection of books related to the day’s activities – and lending them out to visitors who had their library cards with them. Ian’s original and inspiring Alexander Technique teacher – Eileen Johnson took a group through postural work addressing their primary control of the head and neck leading to relaxed posture and use of the body. Eileen used hands-on touch to adjust each person – and the group was encouraged to adjust their own posture in simple movement. More Tai Chi from Ian who sought to explain something of the history of Tai Chi and the way it is good for both health and for martial arts – the first thing that Tai Chi seeks to do is to develop a healthy body with relaxed posture and movement – these are the basic principles. 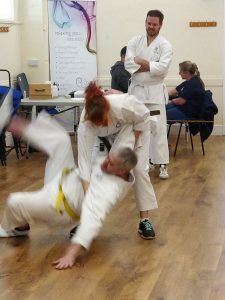 This can then be used to aid movement in daily life and if the student wishes then they can progress further towards the martial aspects. 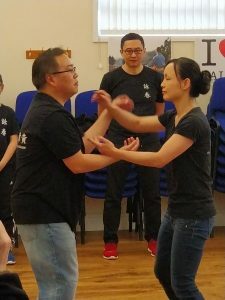 A demonstration of Wing Chun was next on the program – from the William Wong Wing Chun Academy in Shefford who displayed a range of exercises and patterns with students across the age range from young to mature. Finally featuring a young student doing a solo pattern to the delight of the audience. This breadth of relevance whatever age was a continuing theme of the day across all classes. A much anticipated set was the Taekwondo demonstration by Instructor Tom Delve of the Shefford Taekwondo group – he and his class showed powerful martial patterns with punches and blocks and included a display of young students which drew much appreciation from the crowd – this finally culminated in a show of brick breaking by the instructor and his senior students, which had us all urging them on and applauding. 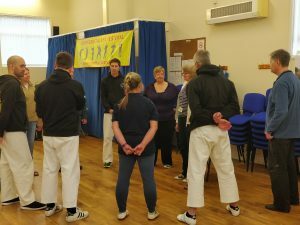 Ian took a further session of Tai Chi where he discussed the way that Natural Movement with relaxed good posture forms the basis for good martial techniques – taking standing exercise into walking and into light co-operative partner work. 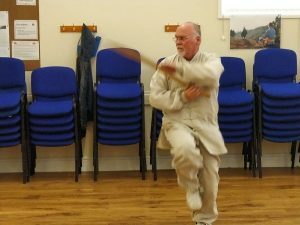 Ian demonstrated both the traditional slow hands free Tai Chi form and a brief but fast Broadsword form which he and senior students practice on Sunday evenings. 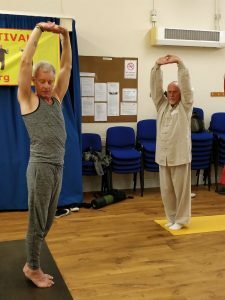 No health and fitness day would be complete without a Yoga class – which was taken by teacher Rick Nunn from 9-Energy Natural Expression – even at the end of the day there were many people still up for joining in with this excellent class which proved challenging and fun. There was even a little friendly competitive spirit expressed by some of the participants who had stayed from the morning and were still looking to enjoy themselves with healthy movement. Rick’s sense of humour in this shared learning environment was appreciated by us all. 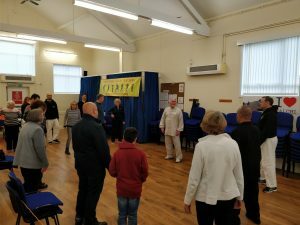 The day closed off with more Tai Chi from Ian who took the class through walking backwards and how it related to balance and natural movement with a little more of the martial aspect. 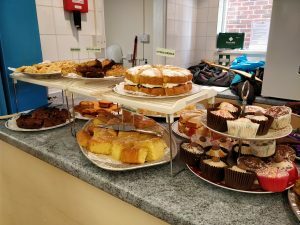 Home baked cakes with tea, coffee and squashes were provided free throughout the day by the Shefford Tai Chi group – with donations for charity collected at the counter which finally totalled £110 – going equally to the World Wide Fund for Nature and Hitchin homeless. Our grateful thanks go to the many volunteers from Shefford Tai Chi who gave their time (and cakes!) to making this annual free community event such a success. 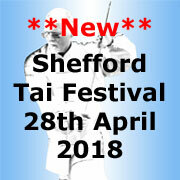 Share the post "2018 Shefford Tai Chi Festival review – World Health Organisation World Tai Chi and Chi Kung Day." 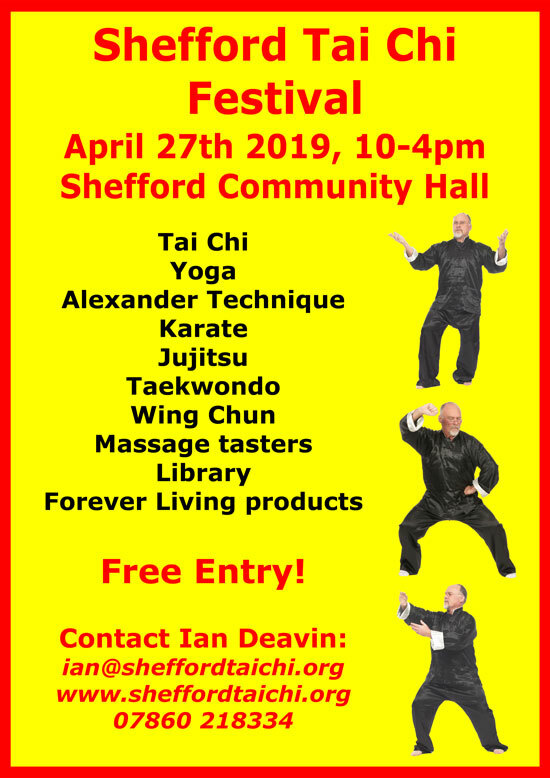 The last Saturday in April is designated by the World Health Organisation as World Tai Chi and Chi Kung Day – so this year we decided to have a festival of Tai Chi and related arts at the Community Hall in Shefford. As a first event we set our sights high but our expectations low – both were exceeded – we lost count of the number of visitors and were totally impressed by the enthusiasm of the demonstrations. For those who dropped in on spec the atmosphere was warm and friendly with a multi-generation make up – so much a community event. 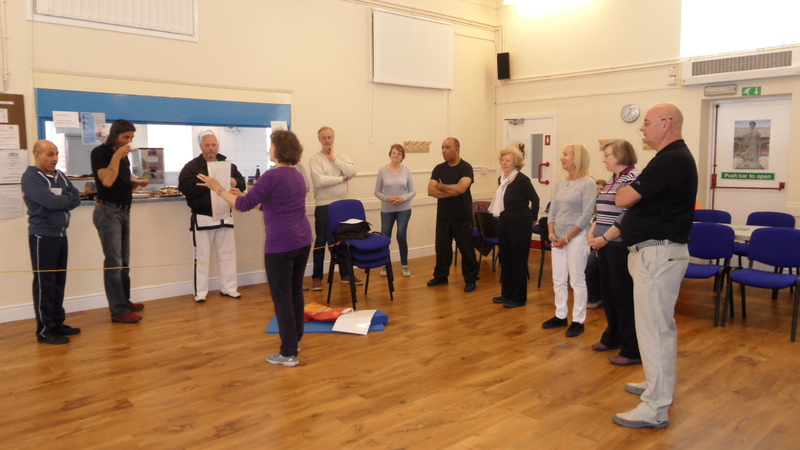 The Tai Chi demos took the form of a short beginners class with lots of people joining in and some demonstrations. This was the sort of class that beginners can expect at classes in the afternoon on Mondays and Sunday evenings at the Community Hall. Les Hummel was our first guest and he took a taster class of Yoga through 1/2 hour of exercises and I started to notice what was to be a trend over the day – so much of the Yoga overlapped with Tai Chi in particular and other demos in general – these activities really are complimentary to each other and to the health and fitness of the human body and mind. 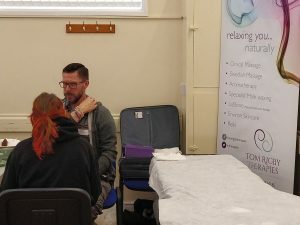 David Sheppard offered massage tasters all day and had a constant flow of takers who got up from the couch looking so relaxed it was wonderful to see. 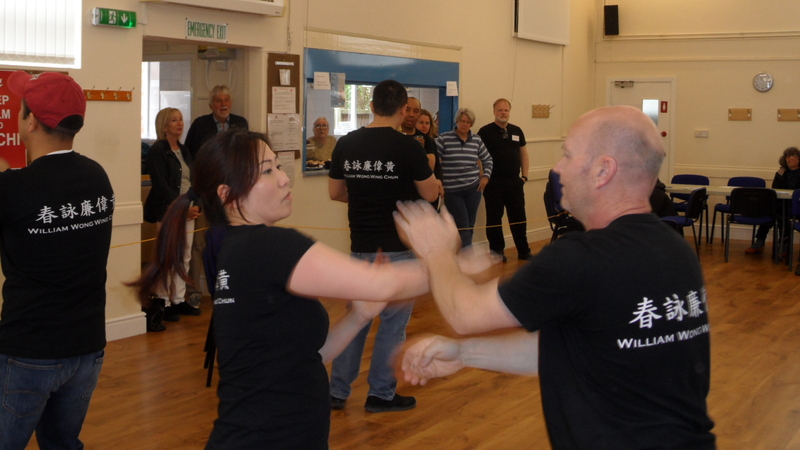 Next up was a delightful group of Wing Chun students from young to a bit older – an exciting and high energy demo for the martially minded under the direction of Master William Wong. Shash Gajjar followed on with a Pilates class for anyone keen to try – Shash did some detail body work with the group and I think all were impressed. 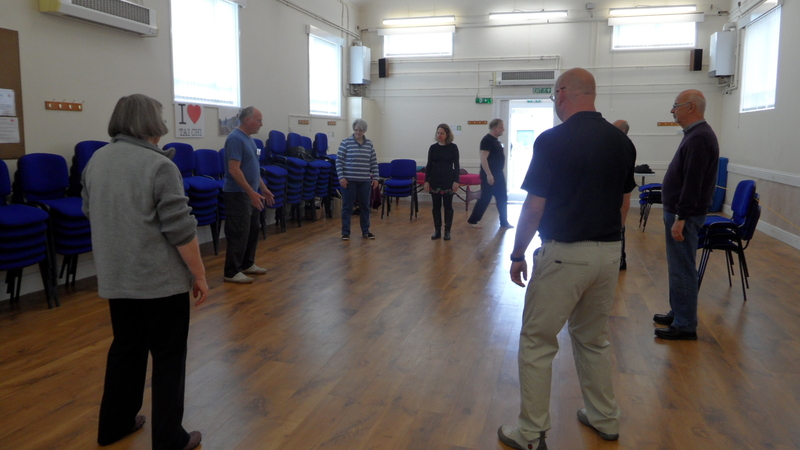 More Tai Chi with on the spot exercises for relaxation and mobility followed by some Tai Chi slow walking and a demonstration of the form. My friend and colleague Judy Hammond took over with a class on Alexander Technique where she worked with individuals on their posture and took us all through some partner work. Judy and I regularly run joint seminars and have a residential retreat coming up on May 12 to 14 – there are places available – see here for details. A quick Tai Chi class with a request from Shash to see “something more advanced” so I did a fast demo of the Chen style Broadsword form which seemed to be enjoyed by all. 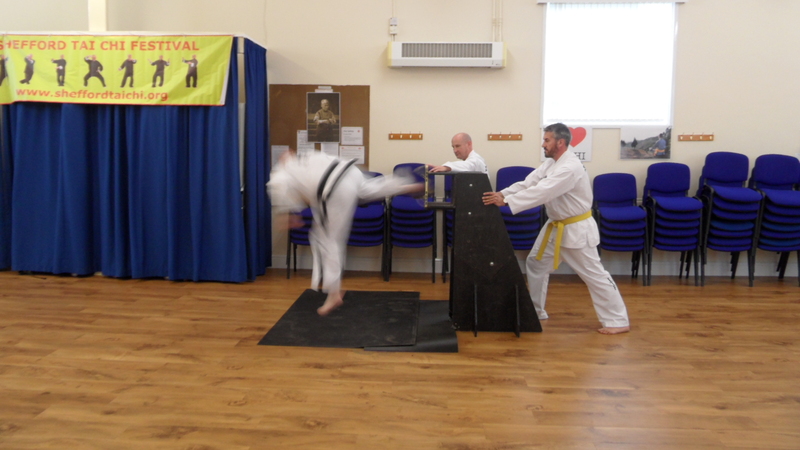 The Community Hall Taekwondo group led by their fourth degree instructor Tom Delve took us back up the energy level with a routine that culminated in a brick breaking demo – do not try this at home kids! Bringing us to lower energy there was more Tai Chi – where did all this Tai Chi come from? Well for those that were interested there was a history chart showing where and how it developed since the early 1600s. 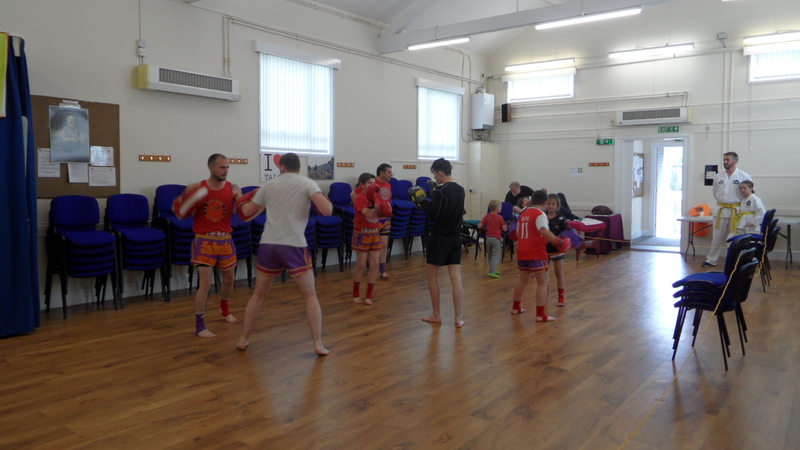 Back up the energy ladder with Thai Kickboxing by Master Miggy Marcantonio and a brilliant class of enthusiastic young students really going for it for 1/2 an hour non stop. The last demo/class of the day was another Tai Chi class to finish off a very successful day. Many many thanks to all who gave up their time to demonstrate and take classes – and of course to all our visitors. Also of course a personal thanks to everybody who gave their time ( and donated cakes! ) 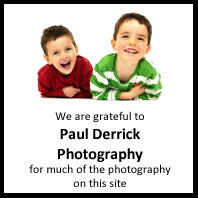 in the organisation and running of the day – what a fantastic team support – thank you. Finally thank you to everybody who donated to charity for their tea/coffee and cakes – we collected over £73 which will be split between the World Wildlife Fund for Nature and a local charity for the Homeless. 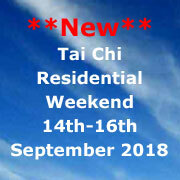 Share the post "World Tai Chi Day – Shefford Tai Chi Festival"
Over my many years of studying and teaching Tai Chi I have recognised that much of individual movement stems from habit – we learn to walk at around 1 year old and then pay it little attention to it until some 60 or so years later when, having accumulated many random poor habits of posture and movement, we notice a certain lessening of physical ability and vulnerability of balance usually coupled with physical and emotional tensions. Along my journey with Tai Chi I came across Alexander Technique which also refers to habits of body use and of the way each part of the body relates to the others. Indeed, I have heard it expressed that “Tai Chi is Alexander Technique with movement.” So it is not surprising that when I met Judy Hammond – an experienced teacher of Alexander Technique – there was a meeting of minds around a shared interest in understanding and teaching healthy ways of moving and healthy living – helping us to live more comfortably and more capably with reduced pain, facilitating the body’s natural healing processes. Helping us to deal with the stresses of daily living. 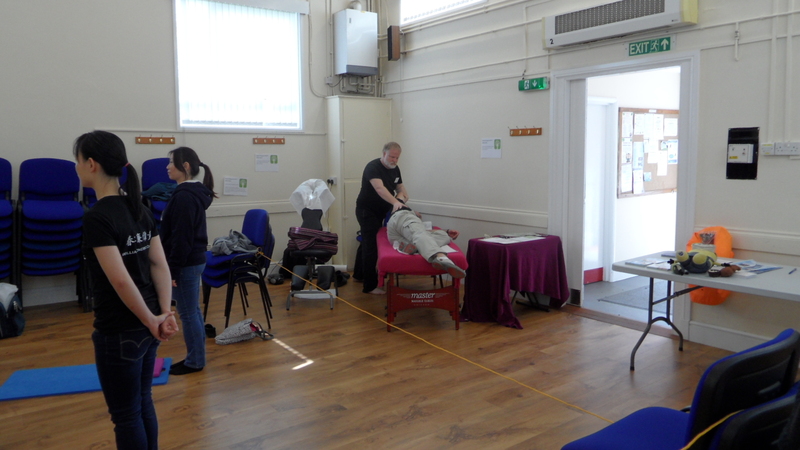 Common approaches include: relax and move, light upright posture, movement from the centre, a connected relationship within the body, passive elastic movement, mindful attention, thoughtful consideration of movement, sensitivity and awareness of body and emotions. Such a common understanding led quite soon to us teaching joint seminars and now joint weekend retreats. Drawing on my own Tai Chi background from Yang Style to Chen Style and Judy’s Moving Mindfully approach, we have developed a unique synthesis – a way of working with exercises inspired by the two disciplines. Further drawing on dance, meditation, visualisation and martial arts experience with a good measure of humour, these Alternative Health Exercises are suitable for beginners and experienced people who will also recognise common themes from other areas such as Yoga and Pilates. Our aim has been to bring together a simple and fun way to develop easy movement as an investment in self. It is our observation that developing a skill in movement leads to a healthier mind and body with enhanced proprioception that enhances static and dynamic balance. 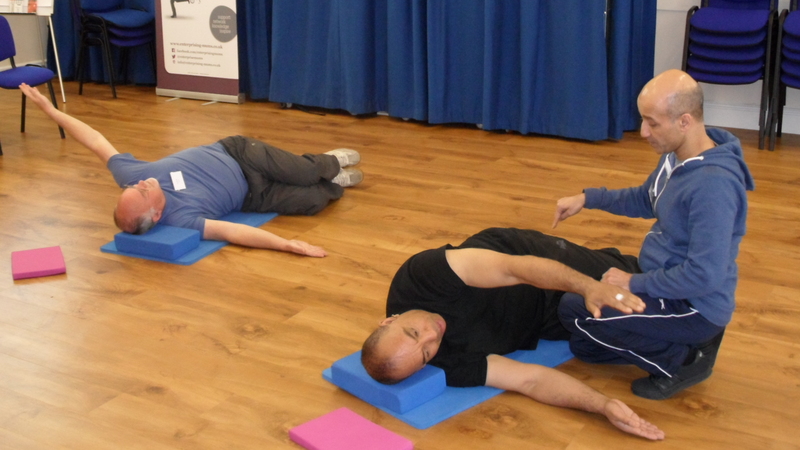 Exercises work to develop inner awareness around the centre line of the body, head floating up, lower body sinking down (heaven and earth), a lithe connectedness, good posture at all times whether seated, standing or in dynamic movement. Meditation and visualisation are used as aids to this awareness and relaxation. In a world where we every day experience the spectrum of life from the fun and enjoyable to the aggressiveness of simple conflicts – as one of my teachers once said: “It is easy to be enlightened on the top of a mountain with no distractions – just come down here where life comes at you like a conveyor belt and then try it!” (Vince Morris). In such a world many people find the natural relaxed movement of Tai Chi to be very therapeutic – both calming and healing. For some the isolation of quiet meditative movement enhances this experience as in solitary practice or individual sessions with a teacher; for others the physical and emotional closeness of group work keeps them grounded in human contact. 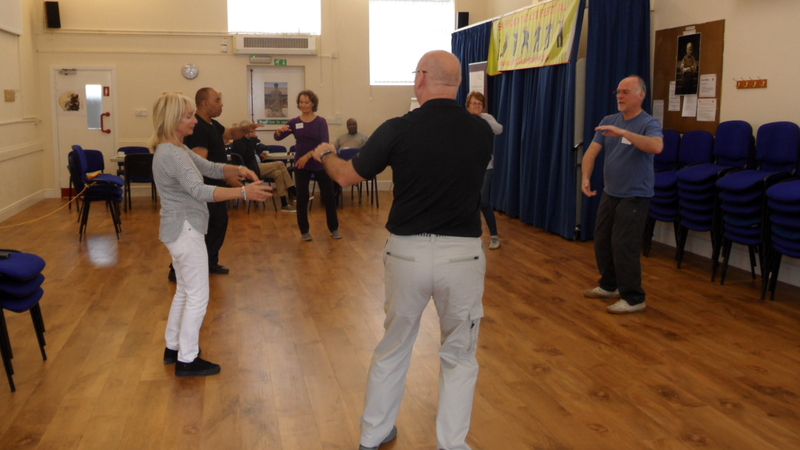 Whatever suits each person the core of Tai Chi movement provides a centre – a structure on which to develop a very special way of being – with at its heart a dedication to resilience, strength and understanding of change leading to a stronger body, mind and spirit. Big claims – but ones which many have found fulfilled. 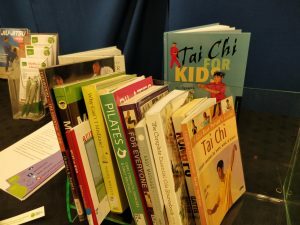 In seeing Tai Chi as therapy, leading to personal development in its widest sense, we should be wary of thinking this might be an “airy fairy” program. On the contrary, it is – or at least can be – a very practical down to earth skill set derived from much practice and hard work with its full measure of fun and challenge. Tai Chi viewed in this way can be understood as a very personal investment in oneself – an investment in future old age and learning to look after yourself – physically, mentally and emotionally. Whatever you are looking for the Tai Chi is the same, it is just a question of how far and how wide any one person wishes to take it. Learning about ourselves and others, we learn to survive and to survive well into long and happy lives by developing our spiritual and emotional growth path. Tai Chi is fundamentally linked to the world views of Taoism and Zen Buddhist meditation and so is a very practical and pragmatic approach with connections to modern day psychology/psychotherapy as well as neurophysiology. As one student explained: “I’d suffered with sciatica for over 10 years and working at a desk bent over a computer screen really didn’t help. I had to have expensive back manipulation and decompression once a month, just to reduce the pain enough for me to function. Tai Chi was suggested to me as something that may help, so I thought “give it a try, what’s the worst that could happen”. By the end of the first month my back pain diminished, and I’ve never needed any treatment since starting. 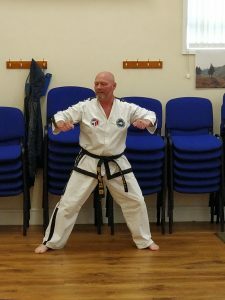 It worked for me, but I didn’t stop then because I thought, “what else can this do for me?” I look at Tai Chi as an insurance policy for health and wellbeing as I get older. Don’t believe for one moment that “you can’t teach an old dog new tricks”, or course you can, as an old dog myself I can vouch for that. I’ve been learning Tai Chi for over 4 years and every lesson opens a new door to understanding how I function now, and gives me the tools to become better. My colleague Judy Hammond explains a similar viewpoint: “As a result of decades of dance, movement and Pilates studies plus the Alexander training, I began to acquire a more immediate understanding of and “feel” for the movement qualities embodied in the great classical techniques of yoga and tai chi as well as other movement and dance forms. Tentatively at first I began to experiment with new teaching methods in an attempt to convey the essence of the appropriate movement quality, employing a multidisciplinary approach, gentle partner work and vivid imagery. Many students visibly and rapidly integrated a broader range of movement qualities plus increased awareness and confidence in moving, and many reported ongoing benefits in everyday life. It is our joint belief that when we feel anxious, depressed or traumatised most of us tend somewhat to absent ourselves from our bodies – the mind races, breathing may become rapid and shallow, neck and shoulders become tense, and we often lose awareness of our legs and feet. These phenomena will be most radical in shock/trauma, but even everyday levels of anxiety may evoke some degree of these responses. One of the most effective and fast acting remedies for these distressing and all too common reactions is to apply mindfulness to our alignment, breathing and movement quality – it can be quite extraordinary to experience how quickly we can regain more comfortable levels of calmness, centeredness and resourcefulness. This year – 2017 – we will be hosting an Alternative Health Exercises weekend at Belsey Bridge in the beautiful Suffolk countryside near the market town of Bungay. This venue has a rich and fascinating history of learning and introspection, being originally a school for orphans run by the neighbouring nunnery. It was at the time also a school, a hospital and home for “fallen women”. The building was later used as a boarding school and now as a religious conference centre – it is ideal for a quiet weekend offering excellent outdoor and indoor spaces for practice and reflection, group meetings and country walks. Share the post "Healthy Movement From Tai Chi & Alexander Technique"